It’s been a minute since we’ve heard from RLSS about their upcoming Wavepuck propeller pump. But just to let us know that this device is well under development and not too far off from commercial release, RLSS has provided us with some fresh new pictures of the Wavepuck in its pre-production trials. The latest look at the innovative Wavepuck powerhead may not look as swanky as the digital renders we first saw, but it’s definitely a completely different animal from the current generation of propeller pumps in the aquarium hobby today. With its inside-out motor design, the Wavepuck is fundamentally different in its construction, appearance, and especially its function. Like any other piece of equipment for our aquariums or our life, we’re always yearning for something faster, brighter, stronger, cheaper etc. When it comes to water motion in our aquariums, we’ve probably already reached ‘peak flow’ for the scales we need it at. A decade of propeller pumps from many different manufacturers have already given us pumps that are strong enough. The RLSS Wavepuck seems like it will be quite different, offering a wide broad flow which still moves a lot of water, but does so in a much more gentle way that is in some ways more desirable than having blasting flow. 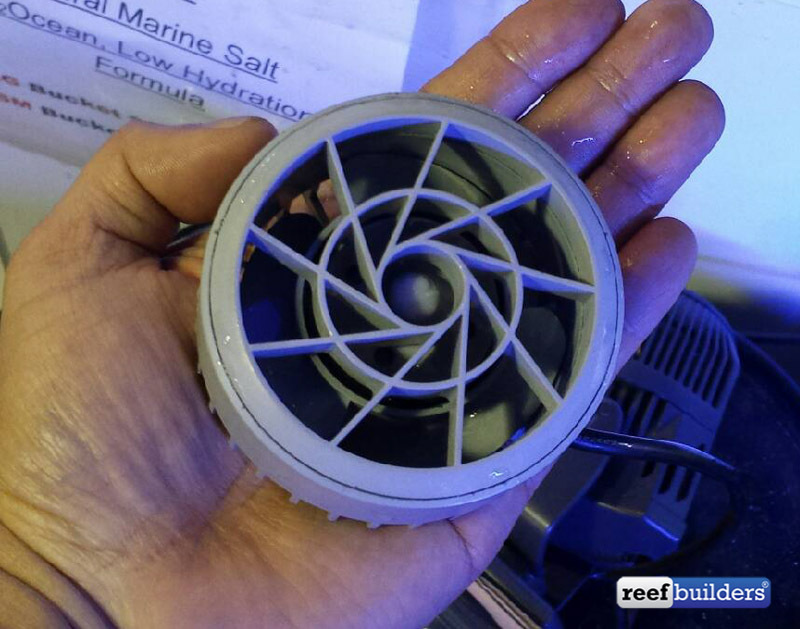 At this point we’re getting ahead of ourselves regarding the Wavepuck, but the shallow depth and large diameter propeller just looks primed to create the kind of broad gentle flow that soft corals, LPS, Euphyllias, and shrooms prefer. One thing we can count on with the Wavepuck pump is that it will have a greatly reduced profile in the aquarium. The design and construction of the Wavepuck is such that it will protrude into the aquarium less than practically any other pump like it. Pricing and release date is still some ways off but this is one pump that we really can’t wait to try out for ourselves. Indian Ocean zebra angelfish found in Central Indonesia!